So while I will try very briefly to make a comparison between the approaches taken by W.H. Auden and William Carlos Williams to this painting, I want to stress out of hand that, although they get there by different routes, they are in my opinion both as good as one can get. Auden’s poem has an introduction which runs like a drop of water down a pane of glass, making detours as it moves down steadily to the bottom. Or else you could visualize it as a walk down a corridor which is full of half-opened doors through which you catch glimpses of life – eating, windows opening, skating, dogness, the wonderful scratching horse. In someone else’s discussion of this poem Robert Frost is quoted as saying, “In three words I can sum up everything I’ve learned in life: It goes on.” And in the second part of the poem, this all comes together forcefully: no one really notices Icarus falling and if we do, we are on that ship of life which goes calmly sailing on. At first sight, Williams’s poem might seem to be only half of Auden’s one. It is shorter and doesn’t stray down country lanes or peer into backyards. 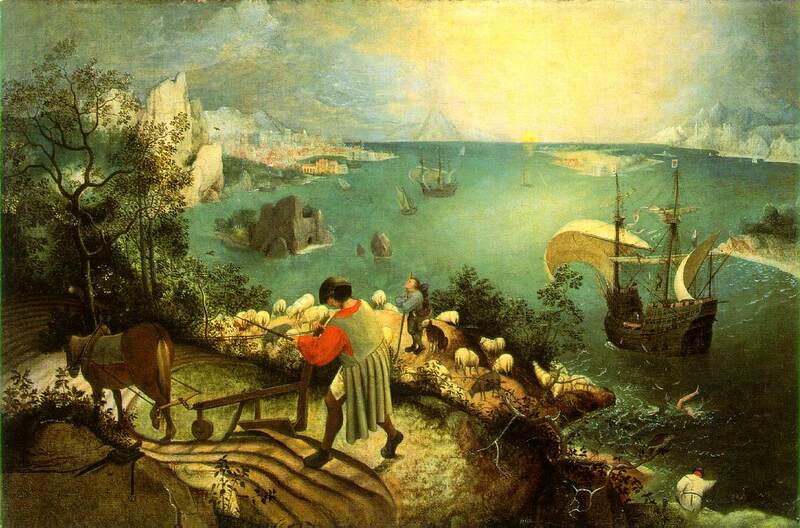 It stays completely within Brueghel’s canvas. But when you read it you realise that Williams manages to make the poem take on the actual shape of what it is saying. The “splash quite unnoticed” comes as a thrown-away surprise which almost slips past our attention too. We don’t even see Icarus. Stated so laconically his fall is just a peripheral sound. Williams makes no mention of the ship on which we can sail on. The poem ends abruptly after the splash with just enough words for the water to circle around Icarus’s point of impact. For those who would like to explore further, someone has compiled a list of poems about this painting which you can consult.